1987 saw two new entries into three-dimensional gaming on home consoles with the SegaScope 3D Glasses for the Sega Master System and the Famicom 3D System for the Nintendo Famicom. Both used an active shutter system that worked on the same principle as Subroc-3D or the Vectrex 3D Imager, but were among the first commercially released devices to use liquid crystal displays rather than mechanical shutters. So no more Vectrex-style clashes of strength between man and machine if you wanted to turn you head, which was a plus. Neither was a success. They were clunky, they were pricey, their game libraries were limited, and the sort of 3D effects an 8-bit system could muster weren't exactly dazzling anyway. Only the SegaScope was ever released outside of Japan, and Sega eventually gave up on it so thoroughly that it couldn't even be plugged in to later versions of the Sega Master System. Each had only a handful of compatible games. SegaScope had eight. Almost all of them helpfully included "3-D" in the name, though in inconsistent and confusing ways. Out Run 3-D was a 3D-enhanced remake of the version of Out Run released on the Master System two years prior, while Zaxxon 3-D was the only version of Zaxxon for the Master System, whereas Space Harrier 3-D was actually a full-blown sequel to Space Harrier. 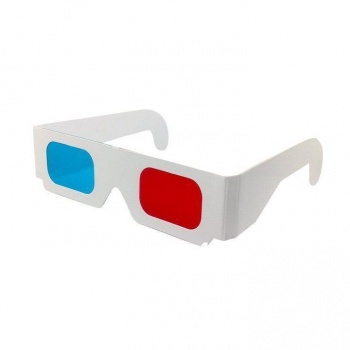 This is the 3D display technology most immediately recognizable to the average person, associated with classic (for a certain value of "classic") B movies of the 1950s. Each eye is covered with a translucent colored lens that filters out different wavelengths of light. Meanwhile, instead of alternating between two streams of shifted images in succession, the display shows both at once - each tinted a different color that will be filtered out by the lens over one eye, but not the other. The tinted, doubled image on the screen will be a hideous, headache-inducing nightmare to anyone looking at it without anaglyph glasses. For those suitably equipped, however, each eye receives only the visual stream intended for it, and the brain obligingly fuses them into a single 3-D image. Take two pieces of plastic, mount them in enough cardboard to keep them affixed to the wearer's face, and you've got 3D - without the need for bulky, expensive active shutter goggles that must be precisely synchronized with the shifting display. The 3D visual quality of anaglyph glasses is not as good as an active shutter system, and all the filtering leaves a final image with a limited, muted spectrum of colors. They are, however, much cheaper, making them a potentially more practical alternative for 3D graphics. Over the years, a number of games have been made attempting to take advantage of that. These span numerous platforms across the decades. Square's 3-D Worldrunner and Rad Racer for the Nintendo Entertainment System have already been mentioned. Others include Wanderer 3D on the Amiga in 1988, Contra: Legacy of War on the PlayStation and Sega Saturn in 1996, and Magic Carpet, Duke Nukem 3-D, and Serious Sam on PC. More recent titles include Invincible Tiger: The Legend of Han Tao, Toy Story Mania!, Minecraft, and Elite: Dangerous. Some of them used 3D as their central selling point, often including a pair of cheap anaglyph glasses packed in with the game. You may have noticed that these games can be divided into two categories: games no one remembers, and games no one remembers featuring an anaglyph 3D mode. Despite numerous attempts and the relative accessibility of the technology, anaglyph 3D has never made much of a splash in gaming. Perhaps it's because of its inferior visual quality, or because you can't make money selling an expensive peripheral for it, or because wearing a piece of cardboard with two differently colored lenses on your face makes you look sillier than even hard-core gamers can tolerate. Whatever the reason, anaglyph's also-ran status seems unlikely to change any time soon.